ALL RIGHT; tonight I'm (hopefully) assuming there's one person in this room who for good reason has been exploring AA lately; someone who has been having trouble with his drinking and to whom the AA message has been carried; who is over the worst of the withdrawal whimwhams and has begun to look around him and wonder what he's getting into. And who has begun to ask questions, like "What is an alcoholic, anyway?" and "What is this thing called AA?" As he thinks about the answers he has received, with his mind made up that there's a pretty good chance he belongs here, naturally at this point he wants to know what he does next in order to put this thing to work for him all the way. The customary initial suggestions have been made to him, and again I'm assuming that he is following them: meetings, meetings, and more meetings; staying away from one drink one day at a time; using the AA tools--the 24-hour plan, the Slogans, the telephone therapy, the Serenity Prayer. What our beginner does now is more of the same. These are the things he has done and the tools he has used to keep him sober today, thus far, and with us it's always today. I'd like to add one heartfelt recommendation of my own, and that's to do a little realistic thinking along about now, and adopt and latch on to a healthy set of attitudes in relation to the entire situation. I often quote the politician who with equal facility could either "anticipate with delight" or "view with alarm." Which approach is the beginner bringing to his new life in AA? His choice will make all the difference in how much or how little he gets out of AA above and beyond physical sobriety. The positive attitude in any endeavor is the one that gets results. The negative attitude never gets off the ground--nor, sometimes, does the alcoholic who persists in "viewing with alarm." The negative approach says, "Poor me. Why me? So I'm sober, but I don't have to like it." The negative type, to be sure, does look around him, but not at the living good examples in an AA meeting, He looks back over his shoulder, out yonder, and thinks: "Joe Bloke can drink and! can't. I'm as good a man as Joe Bloke ever was. It's a damned shame I can't drink like Joe Bloke can. . . . Who says I can't? I'll show them!" And he sure does. There is a place where I can get help for my problem. That place is AA. I'm a lucky guy (or gal) that there is an AA. 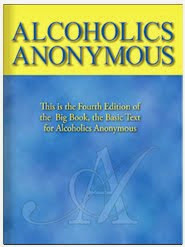 AA teaches me that I cannot safely drink, since I am an alcoholic. There are lots of things worse than being an alcoholic. There are many diseases I definitely would not exchange my alcoholism for. Not all of them can be arrested; mine can. I'm lucky I'm only an alcoholic. For me there is hope. I accept. I realize I'm giving up nothing that's doing me any good; I'm getting rid of something I can no longer live with, and these people tell me I can very well live without. They will even tell me how to do it. I have a lot to learn, so I'd better listen good. I see around me in AA people who are apparently very well adjusted to getting along without drinking. Most of them even seem to prefer it this way. They look fine; they're cheerful, lively, busy, happy. I want some of that, too, along with just merely keeping out of trouble. I'll stand on my head at high noon every day, if they tell me that's what they did to get this thing. . . .
You can "stick with the winners," whose sobriety is the kind you want. Stay away as much as possible--perhaps altogether, for a while, until you're on more solid ground--from old drinking pals who can't be expected to take your present effort as seriously as you do, and whose drinking can set up a resentment in you against your "lot." Resentments can set anyone off again. They're one luxury alcoholics absolutely cannot afford. Don't push your luck. Meals can be found in coffee shops, telephones in drugstores. There's no valid need to go on patronizing your neighborhood bar for commodities such as these. And don't be afraid you'll miss seeing the "kindred souls" in that bar. They may be our beginners of tomorrow! We who are here tonight are the alumni of many bars; we're your kindred spirits, too. You may even get to like us better this way than as the kind of bar-room companions we used to be. Do you like to read? We have a magazine, the Grapevine, that's delightful. We have books you'll get to love. There is also the "little black book," 24 Hours a Day; spend five minutes with it every morning--it will start your day out right. Get busy around the group of your choice. First, of course, join a group. Put down roots, so that you'll become known and will be around and available where the activity is. It's true there are no formal "musts" in AA, but you'll find there are any number of "You'll be better off if you do's," and this is one of them. Count your blessings often. There arc more of them than you perhaps realize, already, and they'll increase with every twenty-four hours of sobriety. Count them especially if you should feel a little self-pity or depression creeping in; force yourself to; see how long your self-pity lasts under that treatment. Counting your blessings will help you stay grateful, and gratitude will help you stay sober. Never say "Never" to anything that comes along in AA. Say "Not today," if you must, but don't set up blocks in your mind that can later become roadblocks in the path to the kind of sobriety you want. At the same time, keep your expectations simple, and watch your natural impatience. Not all of your problems will clear up overnight; they didn't accumulate overnight. Nor is AA going to solve all your problems. It can and will take care of your Number One problem, drinking. And indirectly, through your own sobriety, it will help you solve the others. But this will take a little time; just remember that, in adding one day's sobriety to another, you're gaining on your other objectives. As for the horrible past and the remorse that sometimes threatens to swamp you--don't be too hard on yourself. You have been a very sick person; you're just beginning to recover. 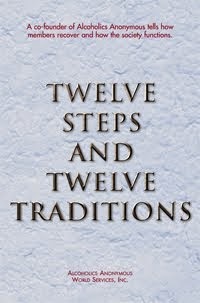 The Twelve Steps will enable you, when you're ready to tackle them, to do all that needs to be done about that past, so that "you can finally let it go; until you are strong enough and ready to deal with it, it will keep. Meantime, this is today, and this is the time in your life that counts--right now.